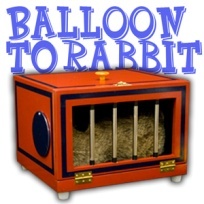 KAP MAGIC SHOP Balloon to Rabbit Box DLX. The performer displays an empty box with a see through front covered with bars. A balloon is placed in the box, clearly visible through that see through front. The balloon is burst and instantly transforms into a bunny rabbit. You could use a pair of doves or other small live stock (white mice, baby chicks, etc.) or large volume of inanimate production items like silks and flowers, sponge and rubber items, etc.